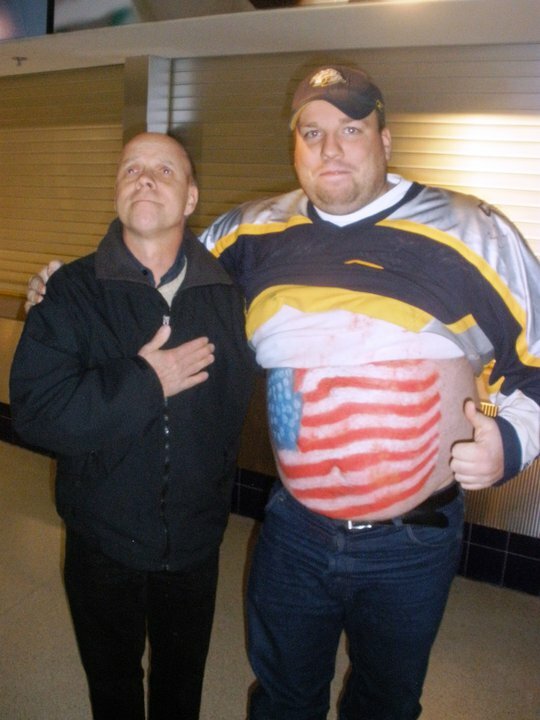 Ben “Big Ben” Butzbach, a passionate Predators fan that so many within the walls of Bridgestone Arena would look to night after night to see what kind of artwork he had created on his belly, was sadly taken from us back on Halloween. Without warning, someone who had become as synonymous with the Predators as had any tradition up to that point, was gone. A man that was as passionate about life as he was about the sport he loved was suddenly taken from all of us. Ben was a hockey fan from an early age, rooting for his favorite team during his youth, the Philadelphia Flyers, he would make the move to Nashville just before the Predators became a member of the NHL. For years, he was one of us, coming to games, cheering on the Preds, and being part of the great fanbase, but he would eventually take his place as one of the most famous fans in Predators history. He started painting his belly, and it seemed an innocent enough idea, but as time passed, the art he displayed began getting the attention of many, including those within the Predators organization. He would become a highlight on many a night, whether the Predators were moving towards an enthralling win, or a heartbreaking defeat, he was a mainstay for several years. He would elevate to the level of “superfan”, and would attain a following of his own. If you knew what was painted on his belly that night, then you might as well have the holy grail, as he and his partners in crime would keep the various designs a secret right up until the time that the music would start up, and there, in all its glory, he would display his latest artwork. The things painted on his belly would run the range of encouragements for the team, messages directed at that night’s opponent, or a special tribute to the many first responders, of which he himself was one. Unfortunately, an accident would take him from the arena for games; being unable to deal with the noise and lights, but he never lost his passion for the game, and was a co-host of Penalty Box Radio right up until his untimely passing. Hockey however was just one of his many passions in life. He was a volunteer firefighter, something he took much pride in, and helped to establish Firehouse Hockey, an organization that helped firefighters and other first responders find a home to play charity hockey tournaments. Even then, you only scratch the surface of who this man was. If you ever met him, you knew that his heart was as big as the belly he used as a canvas. Even if you didn’t know the man, but just went up to meet him, he would treat you as though you had been friends for years. His loss will be felt by those who knew him, and those that knew of him. The true indication of how special someone is, is how their loss is felt by those around them, and in Ben’s case, it was a monumental loss, not only for his close friends, but those that barely knew him. Tributes came pouring in from all over, from his friends posting memories of their times together, to Chris Mason taking a moment out of a Predators broadcast to pay tribute to one of the great fans this team has known, it tells you that Ben will be missed by the entire Predators community, and a large hole has been left in the hearts of many. From his wife Brandy, to his son Jake, both of whom he loved as much as anything else there was in life, to all those that had met him, to those that had just seen him on the screen at games, we all have a place in our hearts for him. From the Cellblock, we will all miss him dearly.